Guilty as charged! I know there’ve been times I’ve disciplined my children for behavior that I felt made me look bad as a parent or for behavior that made me angry because I had to stop whatever I was doing and deal with them. My goal was not to reach their heart, but to stop the wrong behavior as quickly as possible. 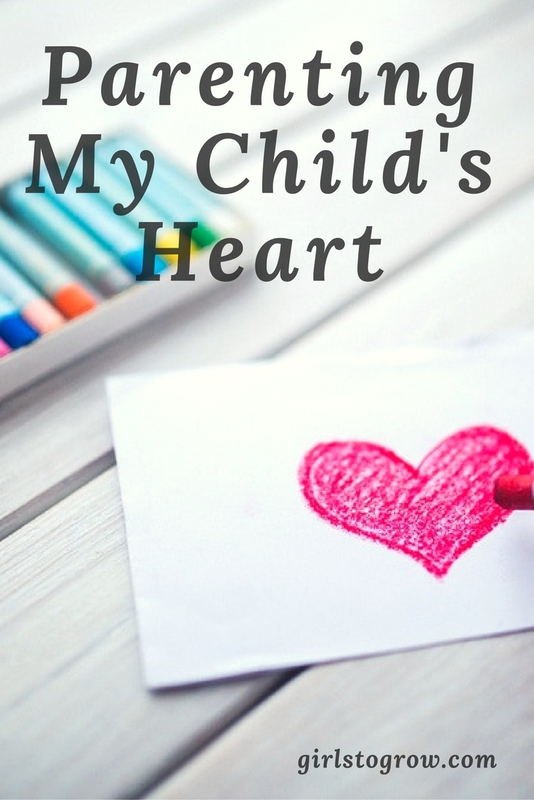 So I wondered, how can I know if I’m parenting my child’s heart? I think if I ask myself the following questions, I might be able to tell. Am I doing what is best for my child in the long run? I don’t want to just solve a misbehavior for the moment, but rather focus on the issue that will matter when she’s an adult. I want to be building her character, not just modifying her behavior so that she will look good on the outside and impress other people. Am I taking the time needed to communicate the lesson that needs to be learned? This one is hard. Sometimes we have to correct on the fly, but if the child is old enough to remember the correction a few hours later, we can go back and talk through the situation. Discuss what happened and how it could be handled better in the future. TIME – that’s what we usually have to be willing to give to reach our child’s heart. Am I willing to deal with my own sin? It’s difficult to correct my child’s behavior when I know I’m in sin myself. Now don’t wait to be perfect before you parent your child! But if it’s obvious that I’ve just dealt with my child in anger, I need to ask forgiveness for my own sin – and ask for her forgiveness – before I attempt to deal with her. Especially as they get older, our children will appreciate our humility and will be more likely to respond to us when they know we still struggle ourselves. Am I building a relationship with my child outside of correcting her behavior? If all I ever do is discipline and punish, my child isn’t going to be interested in listening to me. Spending time with her doing activities she enjoys, talking to her about her day, and just generally showing her that I enjoy being with her will connect us at a deeper level. I want to build a close relationship during the good times so that she will be more inclined to hear my correction when an issue arises. Just writing this post has convicted me about how much I still tend to focus solely on changing outward behavior, even with my teenagers! As we do life with our children today, let’s set our sights on shaping and influencing their heart as we seek to help them live for Christ. Yes – I'm continually reminded of the importance of keeping a calm spirit. Especially since teenage girls can be slightly emotional 😉 it's so helpful if I can just be unruffled and keep the atmosphere pleasant, even if I'm having to deal with them about an issue. I need to focus more on specifically showing them the different things the Bible says, instead of always going to my default: "The Bible says my job is to be your parent and train you up to be able to be a parent yourself."